Blog of a Writer on the Go and Barely Here. A Novella of (Comically) Epic Something-Something....Cover Reveal!!! There. Not all neat and tidy, but a bit cleaner. I know it's been a while, but I'm popping in to share the cover to my latest upcoming book. 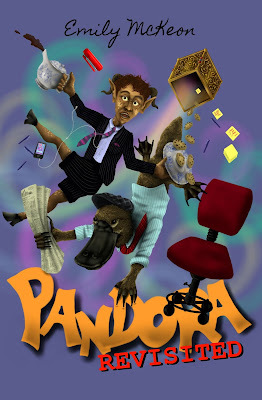 Finally, PANDORA REVISITED will be released to the world. Release date is February 29th. Why? Because Leap Day seemed like an appropriate date for a book of this type. The fantastic and talented S.P. McConnell has provided me with yet another awesome cover that I'm very excited to share. Ready to see it? So?? What do you all think?? I am in love with it and can't wait for February 29th to share the whole book with you all. I'm a mother of two trying to break into the publishing world. Posts made here will mainly concern writing with the occasional thoughts on love, life and motherhood. My books are available at these fine retailers. Want My Posts Sent to Your E-Mail? Emily has read 0 books toward her goal of 75 books. White Mountain (The Darkling Chronicles, Book 1).